Founded on the belief that bees have survived for millions of years without the aid of humans, this group aims to demonstrate that it is possible to provide bees a sanctuary, free of harmful chemicals. We acknowledge that we are mere witnesses of the work of these mini masterful architects. Beekeepers with all types of hives like Warre', Langstroth, Slovenian, and Top Bar are welcome to meet and share their experience. All ideas expressed within the group are of value, because there is much to learn about bees. Experienced beekeepers will mentor the novice. Our passion for learning natural beekeeping has lead us to form this Association on June 4, 2016. 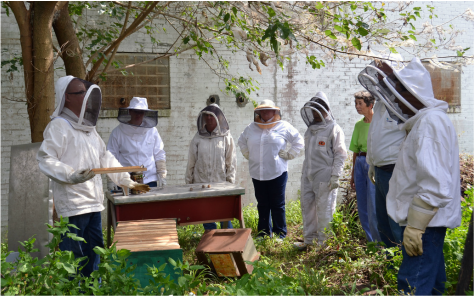 We had our inaugural meeting June 11, 2016 and had a great turn out of beekeepers of all levels. We've completed our second year as an association and we look forward to many more. Topics for upcoming meetings include: natural queen rearing, building a hive, making splits, rendering wax, Mead making, how to build a solar wax melter, and how to do bee removals.